Gov. 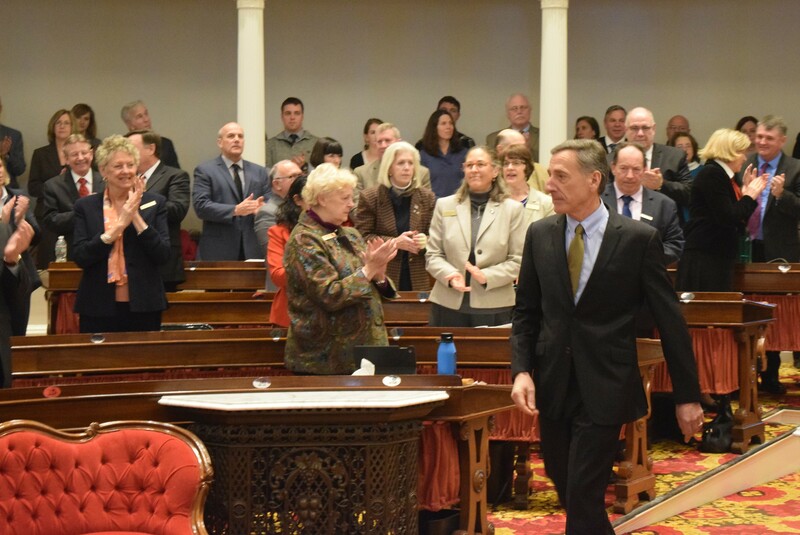 Peter Shumlin arrives for his budget address Thursday at the Statehouse. A day after making the proposal in his budget address, Gov. Peter Shumlin is backing off a plan to change the income threshold for pregnant women to qualify for Medicaid. Shumlin didn't specifically mention the plan in his address, but it was in his written budget summary and was included in details that his administration outlined to media in a briefing Thursday. The plan was to save $4.9 million by changing the income threshold for pregnant women to qualify for Medicaid. Currently, they qualify if their incomes are 213 percent of the federal poverty level. The budget would reduce that to 138 percent of the poverty level. The women would be able to obtain subsidized health coverage through Vermont Health Connect, Agency of Administration Secretary Justin Johnson said Thursday in the media briefing. Shumlin, who likely would have faced a tough time getting the legislature to agree to a plan if it cost low-income pregnant women more money, apparently didn’t realize the savings was counting on that. His staff described the situation as a misunderstanding between agencies about how the savings was being achieved. It's highly unusual for the governor to pull back on a proposal so quickly after rolling it out. “He told the team to find the money elsewhere,” Scott Coriell, the governor’s spokesman, said Friday afternoon. Shumlin will stick with the original policy decision that was at the core of the idea, Coriell said. That’s to make pregnancy a qualifying event for Vermonters to get coverage through Vermont Health Connect.